We were in Honolulu, Hawaii last week, visiting the USS Arizona Memorial. If you haven't been there, it is an incredible experience. Anyway, we met two Pearl Harbor Survivors at the museum. After the tour, we walked back through the parking lot. I saw a beautiful DSOM C-6 Corvette parked in the lot. I was drawn to the license plate, see attached photo. It said "Pearl Harbor Survivor", and was parked in a parking spot labeled "Pearl Harbor Survivor Parking Only". I thought to myself "wow, this guy was living life to the fullest!!" The Corvette owner is named Harold O'Connor. He is the man on the far left. The other survivor is Herb Weatherwax. That's my wife Lori in the center. What a great experience. That is Outstanding! Living Hero’s; after surviving something as horrific as that the Corvette is just rewards for his sacrifice. I'm humbled by these men. What more could you say ... Thanks for your service! Thats cool, he deserves that vette. That's awesome. I was just there a few weeks ago. The tall fences in the background of your picture of the Vette are there to hide the construction going on behind them. The US Parks Service is building a new Arizona Memorial Museum that will be open Dec 7, 2010. The current museum buildings, except the theater, will be demolished. They are also interviewing the remaining Pearl Harbor survivors in High Def so they can preserve those memories for all. Have to love our old veterans, and our new ones for that matter. 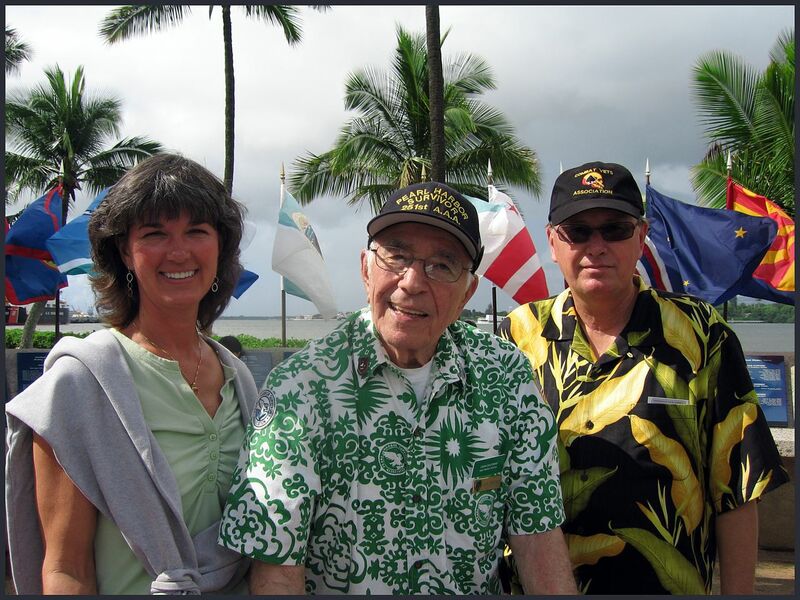 Here is another Pearl Harbor survivor. Took this picture a couple of years ago, He's in the middle, I'm off to the right. Our little Hawaiian vacation, we rented a Mustang convertible, after the Vette, we were not overly impressed. Great story, great photos. God bless them and all who served, and continue to serve. I'll get to Hawaii some day, and when I do the Arizona Memorial will definitely be a stop. great story ! thanks for sharing. Absolutely, GOD bless them!!! I salute all of the brave men and women of all era's of our Armed Forces and especially that one. I was also stationed at Pearl from '70-'72 and then off to our new home port Guam (from there, relieved our sister ship in Nam). Seems like only yesterday. I salute him...and not just for driving a Vette. I've been to the USS Arizona Memorial many times. The Arizona Memorial and the Punchbowl Cemetery are two very special places. Lest we forget. To Harold O'Connor, the Corvette owner, and Herb Weatherwax, I say "I salute you!" I thank these gentlemen for their distinguished service, along with all of their comrades who didn't see the next morning. Next time I hop in the Vette, I will smile knowing I'm in such fine company!